Ketchikan: Catching a Can in Ketchikan; A History of the 'Canned Salmon Capital of the World' a feature story By DAVE KIFFER - In the Spring of 1900, Ketchikan was rife with rumors of war, a salmon war. Washington-based Fidalgo Island Packing was building a cannery near Inman Hill, just south of Ketchikan Creek and the owners of the Alaska Packers Association Cannery near Loring, 20 miles to the north, were furious. 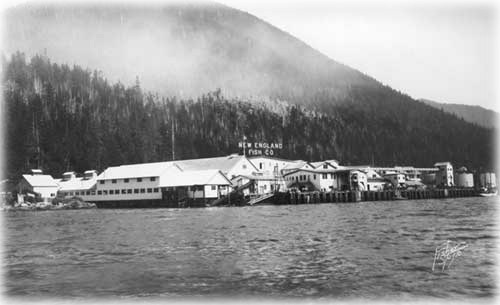 Ketchikan Creek was a prime location for its fishing operations in the area and the APA was not willing to let a newcomer poach its resources. Although it could not stop the construction of the new cannery, the APA vowed to prevent the Fidalgo Island from catching any fish at the new $40,000 cannery. In July, when the silver hordes began to return, the mouth of the creek was flooded by fishermen from both canneries, vying to catch as many fish as possible and prevent their opponents from doing the same. Scuffles broke out and more than a few fishermen ended up in the water, but cooler heads prevailed without any serious violence taking place. The real war was in the court system as Fidalgo sued the Alaska Packers Association. Several years later, the U.S. Circuit Court of Appeals ruled that no one company can claim exclusive rights to the waterways, that no company owns a salmon stream. Both companies would have to share the lucrative stream. But the fish war had stirred up civic-minded sentiments and by the end of August, 1900 ­ just weeks after the Fidalgo cannery packed its first cases on salmon ­ the city of Ketchikan had incorporated. The first mayor was Mike Martin, one of the managers at the Fidalgo cannery. Ketchikan: KETCHIKAN FELON SENTENCED TO 46 MONTHS IN FEDERAL PRISON FOR ILLEGAL POSSESSION OF A FIREARM - Acting United States Attorney Frank V. Russo announced today that Michael McLoon, a resident of Ketchikan, Alaska, was sentenced in federal court in Anchorage to 46 months in prison for his conviction of being a felon in possession of a firearm. United States District Court Judge Ralph R. Beistline imposed the sentence on McLoon, age 41. Petersburg: Southeast Region Crews Continue Battling Mudslides - Maintenance and operations crews from the Alaska Department of Transportation & Public Facilities' Southeast Region are doing battle with Mother Nature this week in Petersburg following mudslides. A DOT&PF crew clears debris from Petersburg's Mitkof Highway Tuesday morning following several days of rainfall-caused slides. 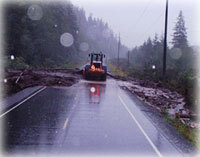 Petersburg experienced a mudslide Sunday at mile point 5.4 of the Mitkof Highway. That mudslide littered the highway with trees and other debris. Crews cleared the road after only a few hours. Alaska: Governor Objects to Irresponsible Legislation from Feds Concerning Wildlife Management - In a letter Tuesday to members of Congress, Alaska Governor Sean Parnell expressed strong opposition to federal legislation designed to eliminate predator control programs that protect valuable wildlife populations in Alaska and other states. "Predator control is about putting food in Alaskans' freezers," Governor Parnell said. "Our programs are scientifically defensible, are used only when absolutely necessary, and have resulted in increased moose and caribou populations. This legislation is an intrusion on states' sovereign authority to manage wildlife, and I urge our delegation and other members of Congress to oppose it." Current federal law allows state employees or licensed individuals to shoot from aircraft to protect prey. Recently introduced legislation would ban airborne predator control unless a biological emergency is imminent and all hunting and harvest has been eliminated. Alaska: Governor Parnell Selects Alaskans for Salmon Treaty Boards - Alaska Governor Sean Parnell on Tuesday selected Alaskans for service on the Pacific Salmon Commission and its panels relating to management of salmon fisheries in Southeast Alaska and Canadian waters. Alaska Science: Albedo change about to alter Alaska By NED ROZELL - You can see it on the mountains-a clean, platinum finish that wasn't there yesterday. It's in the forecast for here in the lowlands, too. Snow. Our world is about to change. We knew it was coming, right? The day I'm writing this, Sept. 21, is the average date at least a trace of snow shows up at the Fairbanks International Airport. So says my friend, National Weather Service hydrologist and fan-of-the-cold Ed Plumb. Sept. 21 is also the date of the earliest measureable snowfall in Anchorage. The average date that snow endures for the winter in Anchorage is Oct. 16. Those in Barrow have already seen the white blanket; their average first date of measureable snowfall is Aug. 26. Michael Reagan: Newspaper Profitability -- Is it Critical to our Democracy? - Today, as you read this column in your favorite newspaper, I hope that you can appreciate the irony of where I am choosing to voice my opposition to President Obama's expressed "happiness" to look at proposals to provide federal funding to help "rescue" the struggling print segment of the Fourth Estate. Just what we needmore of our tax dollars going to pick and choose segments of the public sector that the administration deems worthy of assistance. I do agree with President Obama when he states that good journalism is "critical to the health of our democracy." While I think we can all agree that the media find maintaining neutrality and hiding biases difficult in many circumstances, one cannot discount their role in keeping this nation's representatives in check and sometimes even holding them accountable for their actions. The essential nature of a free press was so recognized by our Founding Fathers that it was enshrined in the Bill of Rights. But these views on the importance of journalism in a free society does not mean I am willing to submit or subscribe to the theory that we can abandon the principles of a free market in order to pick and choose select private industries deemed worthy of receiving federal dollars to bolster their chances of surviving the ever-changing marketplace.